Yesterday I wrote about the mental benefits of yoga and meditation for runners. Today I’m featuring a quick yoga sequence for runners that’s perfect to practice after a run, or at any time during the day when you need to loosen up the muscles that get tight during a run. Because this sequence is short, it doesn’t include a warm up, so if your body isn’t already warmed up from a run, flow through some sun salutations or get your muscles moving in some other way before you start the sequence. Disclaimer: I am a registered yoga teacher, but I’m not your yoga teacher. Always consult your medical professional before starting a new exercise routine. If a pose doesn’t feel right in your body, don’t do it. Never force a pose. If you prefer, you can take a little longer in each pose and just move your way through the major poses in the sequence, starting with Downward Facing Dog. In Downward Facing Dog, focus on stretching out through your calves and your ankles, as well as the backs of your legs. Keeping your hands shoulder-width apart and your feet hip-width apart, sink your heels down towards the floor or your yoga mat. Pull your heart closer to your thighs to help deepen the opening through your shoulders and through the backs of your legs. From Downward Facing Dog, you can inhale each leg up for a Three Legged Dog, bending your knee and stacking the top hip over the bottom hip. This helps to open the hips. Only open the hip as far as you feel a gentle opening, hold for a few breaths, and then release. Be sure to hold on the other side for an equal number of breaths. Coming back to Downward Facing Dog, walk your feet forward behind your hands, keeping them hip distance apart. Bend your knees a lot, letting your belly fall towards your thighs for Rag Doll. Reach for your elbows as you let your head, neck and upper body hang. As you feel the muscles in the backs of your legs start to open, you can take a small bit of the bend out of your knees. Hold for several breaths to a minute, depending on what feels right in your body. 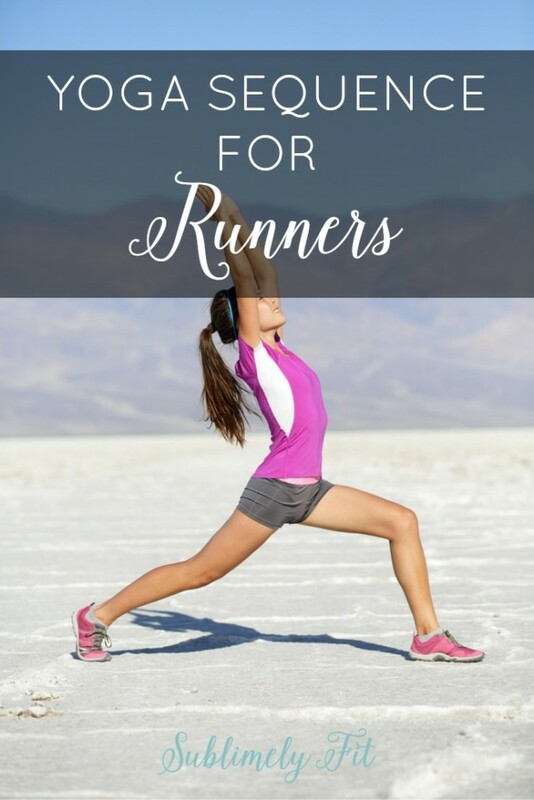 Runners: looking to loosen up after a run? Try this yoga sequence for runners! From Rag Doll, make your way back to your Downward Facing Dog, either by directly stepping back or flowing through a vinyasa (High Plank to Low Plank to Upward Facing Dog to Downward Facing Dog). From there, sweep your right leg forward for a Low Lunge, having the option to bring your back knee to the mat or on top of a blanket. Press your hips forward to stretch through the hip flexor of your right leg. Hold for a few breaths, then step back to Downward Facing Dog, stepping your left leg forward into Low Lunge and holding for an equal number of breaths. After holding Low Lunge on both sides, press back to Downward Facing Dog, then walk your feet forward, coming to a seat. Roll on your back, making your way into Reclined Pigeon Pose. Cross your right ankle over your left thigh, just above the left knee. Hold there if that’s enough stretch through the hip, or pull the legs in to intensify. 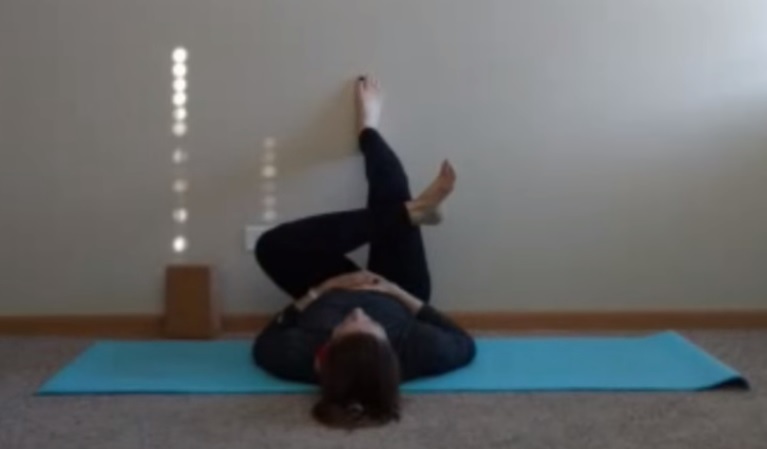 Or, to make the pose a more restorative pose, bring your back foot to a wall, using the wall to help pull your legs toward your body. The closer your seat is to the wall, the more intense the stretch will be. Hold for several breaths to a minute, then switch sides. Carefully press yourself up to a seated position, bringing your right heel and foot in close to your left hip. Bring your left leg on top, working to stack your left knee on top of your right leg if you have the flexibility. You can move your feet farther away or closer to your seat until you find a comfortable stretch through your top hip. If you’d like to intensify, you can gently fold forward, but only take this option if you’re not feeling a comfortable stretch in the seated option. Hold for several breaths, then switch sides, bringing your right leg on top of the left. Finally, work your way into Butterfly Pose to open the insides of your thighs. 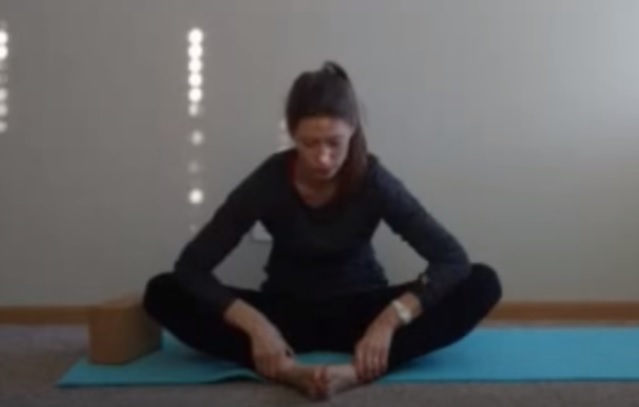 Bring the soles of your feet together as your knees come out to the sides, using your outer thigh muscles to pull the outsides of your knees closer to your mat. You can stay here or gently melt forward, with an option to intensify the pose by pressing your knees down with your elbows as you reach your hands for your ankles. Hold for a few breaths, then slowly roll back up, releasing out of the pose when you’re ready. 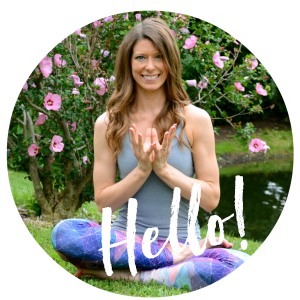 Linking up with Jill and Jen for the Inspired to be Fit linkup! 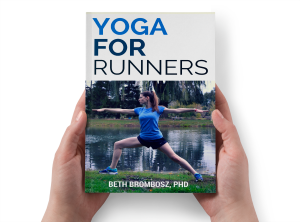 Would you love to learn more about yoga for runners? Sign up for my FREE Two Week Yoga for Runners Challenge! 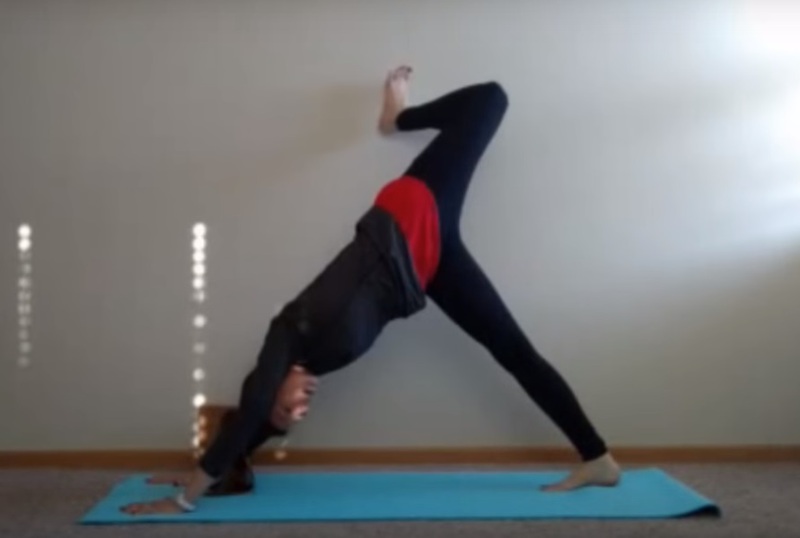 Runner-yogis: what are your favorite poses to practice? Yeah, I avoid frog, too. 😉 It’s so intense! Hope you have a great weekend, Wendy! Love this! I’ll have to try it out after my next run! Oh. How I miss yoga. And running. Le sigh. Cow faced pose is one of my favorites! Me too! My piriformis is almost perpetually tight and Cow Face is wonderful for that! This is such a great sequence! I’ve been out of the running game lately, but still love a good yoga sesh. Definitely trying this one out tomorrow post-workout! Thanks, Jen! Let me know what you think if you try it out–I’d love to hear your feedback! Thanks for sharing! I often need some stretching and hip openers when I’m tight and sore from running. You are so welcome, Sarah! I hope it helps. Let me know what you think if you give it a try! Love these poses. All of them! Thank you, Tara! Glad you like the sequence! You’ve included some of my favorite poses! I started yoga teacher training on Friday. It’s awesome. Even better than I expected and very intense physically. We squeezed in a whole lot of yoga in 2 1/2 days. Hooray! So glad you had a good time, Jill. Everything about yoga teacher training is overwhelming, both physically and mentally. But, it’s so worth it and you always love every minute of it. Anything that works my hips is a winner for me, so I really love yoga and haven’t practiced in quite some time! I need to get back at it! Right there with ya, Janelle! Hip openers are my favorite, too. Good luck getting back into your practice!